The O shelf is crowded with books by Oates and O'Brien, Oke and Orwell. 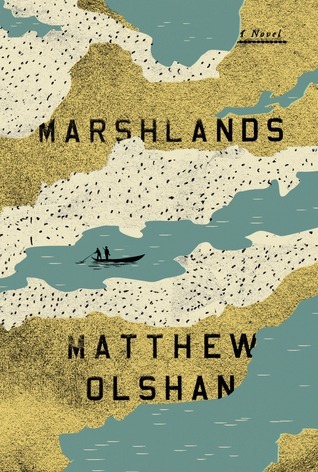 But hiding in their midst is a slender, unassuming novel by Matthew Olshan called Marshlands. It's a quiet novel "of occupation and empire, loyalty and treason", with spare prose that is surprisingly powerful, and a narrative that's written in reverse. Part one of Marshlands begins with the release of an aging political prisoner, a former doctor and officer who was part of the occupation of the Marshlands. Gus's crime of treason is only hinted at as he is returned to the Capital where he no longer has a home, family, or any friends. And where he hopes no one will recognize him. But then he runs into someone and something familiar at the National Museum: a controversial exhibit that is about to open on the Marshlands and the conquered people who once lived there. A people he came to know and admire. Part two continues the story, but jumps back twenty-one years to do it, back to when Gus is serving as an Administrator in the Marshlands, and to the choices he makes that earn him the label of traitor. Part three takes another narrative leap back eleven years to the beginning of the end; it's here where you finally start to understand what makes Gus the man he becomes. I'm not explaining it well, but this style of reverse narration is definitely an interesting way to tell a story. It makes Olshan's writing feel very literary. And while I wouldn't want to read a lot of books written this way, I did end up liking this one. Even though at times I wanted a little more detail about the Marshmen and their history, and a little more of Gus's story, too; because I found them both interesting and intriguing. Marshlands is different: a little sad, but uniquely memorable. I'd call it another serendipitous find from the O shelf. This sounds interesting. When was it published? In 2014. So fairly recently. It's your words and your writing that inspired them. Thanks for a lovely book! This does sound like a really unique way to tell a story. You are great at highlighting books I haven't even heard about, Lark! You've definitely piqued my interest, Lark. The spare prose, written in reverse, and a quiet novel. This sounds like one worth picking up. Thank you for bringing it to my attention. I hope you get a chance to give this one a try; it won't take you long to read it as it's under 200 pages. But I liked that it was so different from what I normally read.